Doctors diagnose osteoarthritis by considering a patient's medical history, physical examination, and images of the affected joints. X-rays create the images which are used to detect osteoarthritis. While x-rays are used to reveal the appearance of osteoarthritic joints to diagnosticians, there is not always a direct correlation between what the x-rays show and the symptoms of osteoarthritis that a patient is experiencing. By age 40, many people have some evidence of osteoarthritis on x-rays. According to the American College of Rheumatology, 70 percent of people over the age of 70 have x-ray evidence of osteoarthritis even though only half develop symptoms. X-rays of osteoarthritis do not detect early cartilage abnormalities. Also, x-rays can show mild osteoarthritis (i.e., minor abnormalities) while a patient may be experiencing severe symptoms. Conversely, an x-ray may show changes indicative of advanced or severe osteoarthritis while a patient may have few or no symptoms. Early cartilage abnormalities are detectable with magnetic resonance imaging but MRIs are rarely used for routine diagnosis of osteoarthritis. 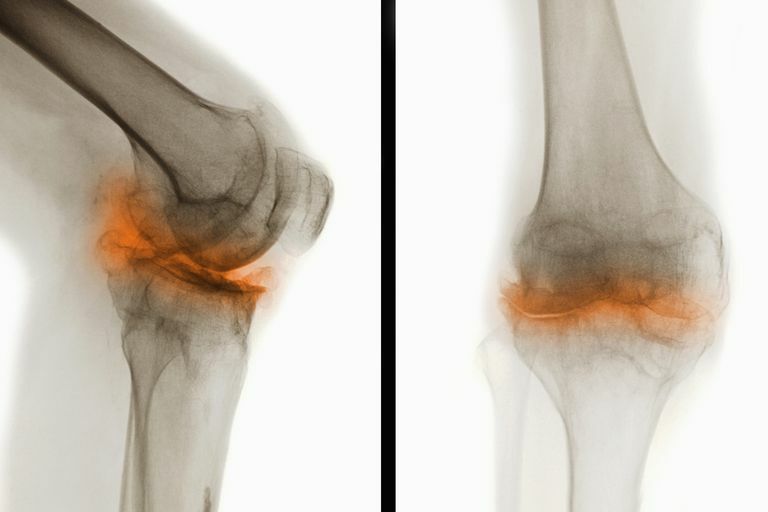 Though symptoms may not directly correlate with x-ray evidence of osteoarthritis, it is typical for a doctor to order x-rays of a painful joint. There are certain x-ray findings which can help doctors and radiologists formulate impressions and diagnose osteoarthritis. The findings include the following. Osteoarthritis causes deterioration of the joint structures. Wearing away or deterioration of articular cartilage leads to narrowing of the joint space (i.e., the space between the end of bones in a joint). Progressively smaller joint space suggests worsening of osteoarthritis. Joint space loss is usually not uniform within the joint. "Bone-on-bone" suggests there is no joint space left. Osteophytes, also called bone spurs, are protrusions of bone and cartilage. The bony projections are commonly seen in areas of a degenerating joint and can be seen on x-rays. Osteophytes, which typically develop as a reparative response by remaining cartilage, cause pain and limited range of motion in the affected joint. Subchondral bone is the layer of bone just below the cartilage. Sclerosis means that there is a hardening of tissue. Subchondral sclerosis is seen on x-ray as increased bone density, frequently found adjacent to joint space narrowing. The degeneration of bone which occurs in osteoarthritis causes the bone to turn into a dense mass at the articular surfaces of the bone. Subchondral cysts are fluid-filled sacs which extrude from the joint. The cysts contain thickened joint material, mostly hyaluronic acid. Traumatized subchondral bone undergoes cystic degeneration. Subluxation can also be seen on x-ray as a possible consequence of osteoarthritis. Subluxation is a partial dislocation of a bone. Osteoarthritis, Primary. eMedicine. January 24, 2007. Radiographic Assessment of Osteoarthritis. American Family Physician. July 15, 2001. Treating Subchondral Cysts. Arthritis Today. The Best of "On Call."